Roughly 85% of U.S. adults suffer from some form of gum disease, yet only a small percentage actually receives treatment. Gum disease has been linked to a variety of health complications including but not limited to heart disease, certain cancers, diabetes, Alzheimer's and low birth-weight babies. While gum disease might seem like an inconvenience or irritation in its early stages, it is a significant health risk that should be taken seriously. Gum disease is an epidemic in this country and around the world, and until now the majority of the treatment options available included invasive surgery involving cutting the gum tissue down and suturing it back together, or extracting the teeth and recommending dentures or dental implants. But the day has finally arrived when patients do not have to fear or put off getting treatment! With the PerioLase® MVP-7™and the LANAP® protocol, we are able to remove the bacteria within the pockets of your gums while leaving the healthy tissue behind to reattach to the root surface! Why is this important? The procedure is less painful, produces less recession and less sensitivity, and has much better and more predictable long-term results. That means The LANAP protocol is the highest standard of care available in the world for the treatment of periodontal disease. Often we can save teeth that have previously been deemed hopeless, and regenerate the bone around the tooth. If saving your teeth without painful surgery and maintaining optimum periodontal health is important to you, this is a treatment that you must consider! LANAP treatment is the first and only laser protocol awarded FDA clearance for True Periodontal Regeneration. Its effectiveness is backed by both domestic and international studies. LANAP protocol can save teeth that would otherwise require extraction by promoting bone regeneration around the tooth. LANAP treatment saves teeth, reduces pocket depth, and regenerates bone growth to achieve optimum periodontal health. Go with the innovators, not the imitators. LANAP treatment is the ONLY FDA cleared protocol for full mouth True Periodontal Regeneration, the gold standard of gum disease treatment! It is also the ONLY laser with the science, research, and human histological studies to PROVE its claims! No matter which clinician you decide to get laser treatment from, be sure that your doctors are LANAP Certified and using the PerioLase® MVP- 7™. The LANAP protocol CANNOT be performed using other lasers. Right now there are millions of Americans living with gum disease; however, only a small percentage of this number will seek professional treatment – either from fear of treatment or lack of understanding the serious consequences of untreated gum disease. Research has linked gum disease to a variety of health complications including diabetes, heart disease, pancreatic cancer, and low birth weight. Until recently, treatments for gum disease have been invasive and painful. Proper treatment meant either dental surgery to cut and remove affected gums or extracting teeth and replacing them with dentures or dental implants. Recent advances in dental technology have provided a more precise alternative with the PerioLase® MV P-7™ and the LANAP® protocol (Laser Assisted New Attachment Procedure). The LANAP procedure utilizes the highly specialized PerioLase MVP-7 laser to provide a less invasive, more acute treatment for gum disease. The protocol targets and kills the bacteria that cause gum disease, without harming healthy tissue. LANAP protocol treats gum disease without the pain, gum line recession, or increased sensitivity traditionally associated with periodontal surgery. Additionally , LANAP treatment offers more predictable long-term results. Faster Healing - LANAP treatment is minimally invasive and allows the body to recover and heal more quickly. Less Discomfort - The PerioLase MVP-7 incites bio-stimulation in the treated areas which expedites healing and decreases the need for post-operative pain medication. Reduction in Gum Inflammation and Bleeding - LANAP surgery can remove up to 90% of oral inflammation in one visit. The PerioLase MVP-7 targets inflammatory bacteria causing gum disaease without injuring healthy tissue. Minimal Operative Bleeding - PerioLase MVP-7 controls bleeding during surgery through the formation of clots and minimizes the risk of bleeding and complications. 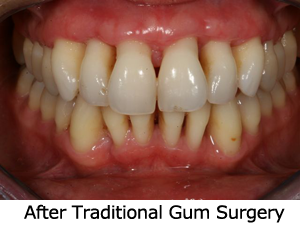 Saving of Teeth - Patients can keep their natural teeth sometimes even when the teeth have been deemed unsalvageable with traditional treatments! Regeneration of Bone - LANAP treatment is the only protocol that is scientifically proven to regenerate bone and tissues around teeth. Safety - LANAP treatment has zero contraindications; it does not interfere with any other diseases or medications. Patients can stay on blood thinners such as Coumadin. If you have been told that you have periodontal disease and surgery will be required, it is important to know the difference between traditional gum surgery, which utilizes a scalpel and sutures, and laser surgery. Traditional surgery typically utilizes a scalpel so that the doctor can reflect the gum tissue back for visibility and to clean the pocket and reduce the pocket depth. The pocket depth is reduced by cutting away tissue. In many cases the additional use of bone grafting or membrane materials will be needed in order to achieve reattachment of the gum tissue to the root surface of the tooth. Although in some cases the only way to treat the patient is by traditional surgery the vast majority of patients that we see opt for the less invasive and more comfortable LANAP protocol. 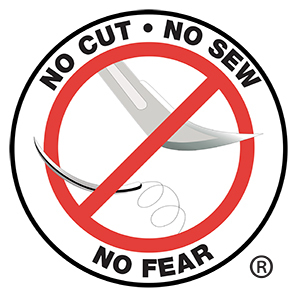 LANAP surgery does not require the use of a blade, or sutures. It is a minimally invasive surgery that results in very little recession and pain for the patient. The laser operates at a wavelength that can tell the difference between the diseased tissue and the healthy tissue. This means that the laser is extremely safe and selective when being used in surgery. For the first time we can remove the diseased tissue and bacteria from your gums without harming, cutting, or removing healthy tissue! Pain - Traditional surgery can be fairly painful and require pain medication and downtime. Many patients opt for dental implants to avoid the pain involved in gum surgery. The LANAP protocol involves much less discomfort. There is almost never a need to prescribe pain medication and the patients can usually go right back to work and move on with their daily routine. After Traditional Gum Surgery Recession - Because traditional surgery requires the use of a blade there is no getting away from the gum line being reduced. The question is how much. Traditional surgery can result in lowering the gum line anywhere from 2-4 mm all the way to 10-15mm. LANAP treatment is much less invasive and more selective in the tissue that it cuts. This results in little to no recession of the gum line. This is a very important difference because recession can lead to a number of aesthetic problems for the patient, and cause the teeth to become very sensitive to cold and hot temperatures. Healing Time - The healing time for LANAP treatment is much faster because it is an advanced technology that is less invasive than scalpel surgery. The laser kills the bacteria in your pockets resulting in reduction of inflammation and healthier tissue. Long-term results - Although we can have fantastic results long term with both treatments, LANAP treatment is far more predictable when it comes to bone regeneration and connective reattachment of the tissue. The laser stimulates the bone that surrounds the root of the tooth and has been proven to encourage regeneration, often saving teeth that would have previously been extracted. Many times we can reverse the effects of periodontal disease and the patient will get better and better as time goes on.